Are you a researcher who realises the importance of sharing your research with a wider audience? Maybe you've seen your field of science misrepresented or badly reported in the news. Would you like to be heard when your field of expertise hits the news? 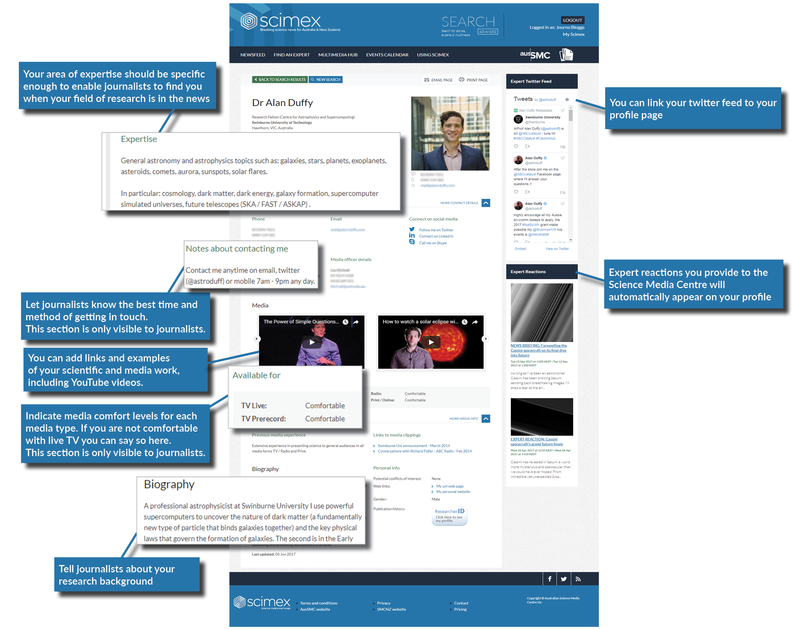 Scimex enables researchers to communicate science to the public through the media and is free for experts. For further details, see below. Any questions? Contact the Scimex team. For additional information on media work, check out our Working with the Media page. Our 'Find an Expert' database helps put you in touch with journalists to ensure your voice is heard when your subject hits the headlines. As a registered expert you can specify what types of media you're comfortable with. After all, live TV isn't everyone's cup of tea. You can upload video clips and your Twitter feed to your profile page, allowing you to showcase your communication skills to registered journalists. Only registered journalists will be able to see your contact details. Scimex contains a searchable library of images and videos that journalists can use with their stories. As a registered expert on Scimex you can add your own items to the library if you are comfortable offering your work under a Creative Commons licence. Users of your material must credit you in all cases. Note: Creative Commons licenses cannot be revoked. Any event deemed newsworthy can be added to the Scimex calendar of events for Australia and New Zealand. Registered experts can submit an event for consideration via the event calendar module. Is your ground-breaking paper being published in a journal in the near future? The Scimex Newsfeed allows your media team to upload media releases, scientific papers, multimedia content and expert contact details. An email will then alert registered journalists, and all uploaded materials will be available for them to download from the site. Don't forget it helps to know about scientific papers in advance, rather than after publication. Let us and your media team know about your research as early as you can. If you don't have a media team, contact us. Scimex works collaboratively with institutional media teams wherever possible. Please ask your media team to register with Scimex. For a wide variety of additional resources and advice to help you build up your media skills, see our Working with the Media section.